The Scarab Club opened it’s doors on Farnsworth in 1928 joining the year-old DIA building in Detroit’s newly formed Cultural Center. 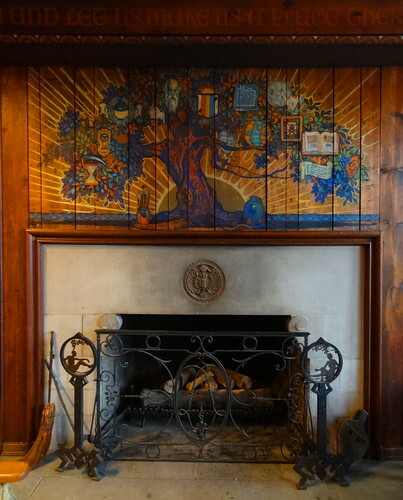 The beautiful Arts and Crafts structure was designed by architect and member Lancelot Sukert. 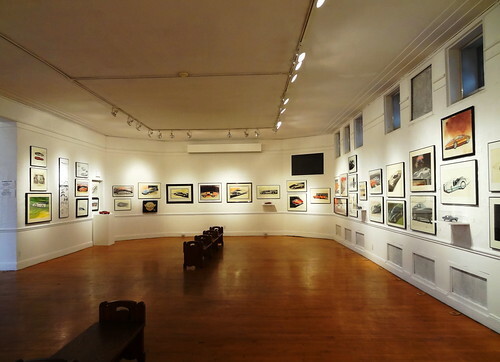 Home to an artists club, gallery and studios, artists and art lovers meet here regularly to socialize and talk art. 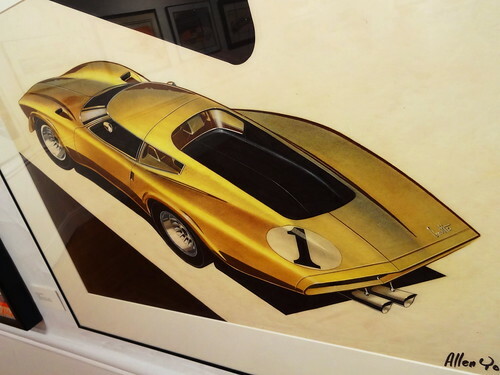 Back in the early 20th century Detroit gave birth to a new art form: automotive design and with it the evolution of automobile advertising art. 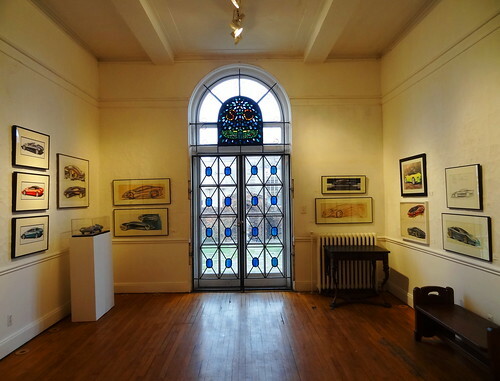 Many of the original founding members of the Scarab Club were automotive designers, illustrators, graphic artists, photographers, architects and automobile company owners. 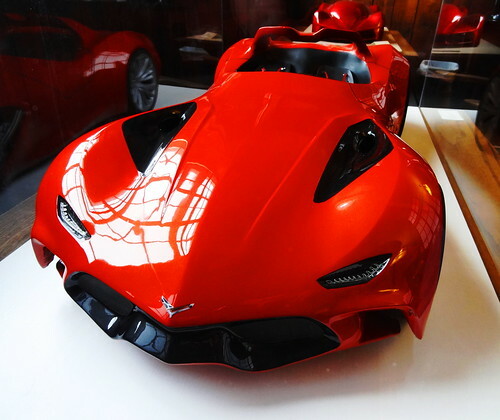 It’s only fitting that American Dreaming: Corvette, 7 Generations and Beyond is on exhibit in the main gallery. 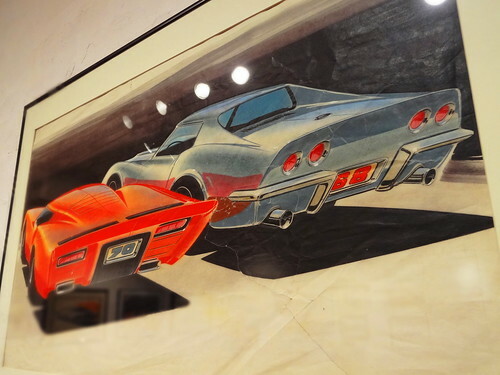 The documentary, American Dreaming, about the Detroit artists who designed cars from 1946-1973 is in the process of being completed; the film covers Ford, GM, Chrysler, Packard, Studebaker, Nash and Hudson, this exhibit focuses solely on the Chevrolet Corvette. Introduced in 1953 the Corvette became the iconic American sports car. 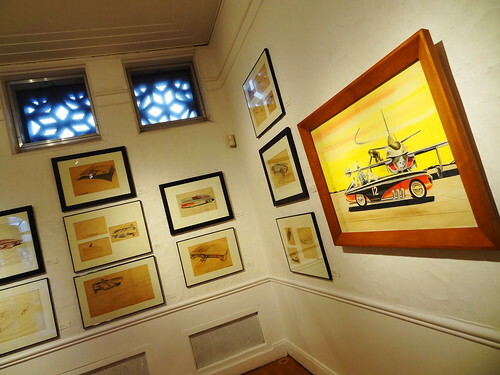 Here we see original drawings and models created by General Motors designers, the fact that these drawings still exist and are on display for all of us to see is incredible. 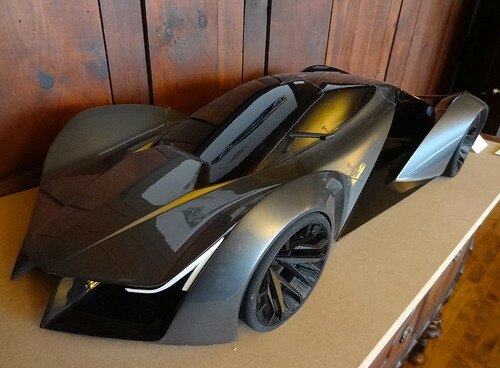 In the design studios talented men and women put pencil to paper sketching cars straight from their imaginations. Studios were closely guarded, manufacturers considered the drawings company property, artists were not allowed to keep their work, instead most was destroyed. Once the artists figured out what was happening they found a way to sneak their drawings out, it was risky, you could lose your job if caught. They took their chances. 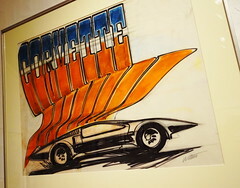 Just look at the photographs of the framed sketches; side pipes, flames shooting out from dual exhaust pipes, bold colors, sleek designs all expressing the American optimism of the time. Concept cars were futuristic, they could fly through space, drive on elevated super-highways, they were race cars for the ordinary guy. Cars were beautiful, elegant, glamorous, exotic. One of my favorites is the gold Corvette with the #1 by Allen Young, the 1956 by Brock looks like a cousin of the Batmobile; drivers wear helmets, their faces carry the look of speed. We see the Corvette from all angles, some drawings focus on tail lights or the grill, monotone or color they’re all incredibly cool! The plain white paper has yellowed over the years but the designs look as fresh as if they were done yesterday. 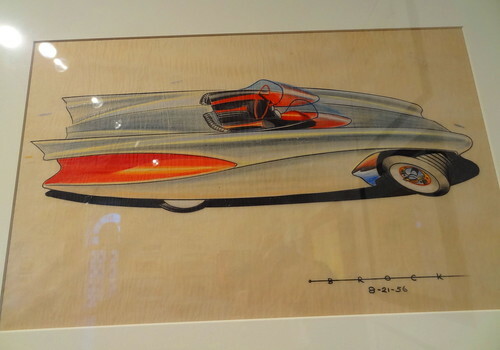 These rare, vintage drawings still capture our attention. 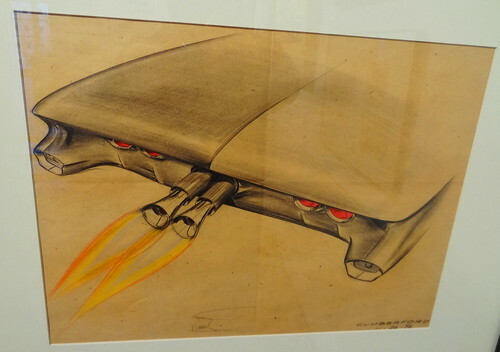 Concept art is finally getting its due and being recognized as fine art. 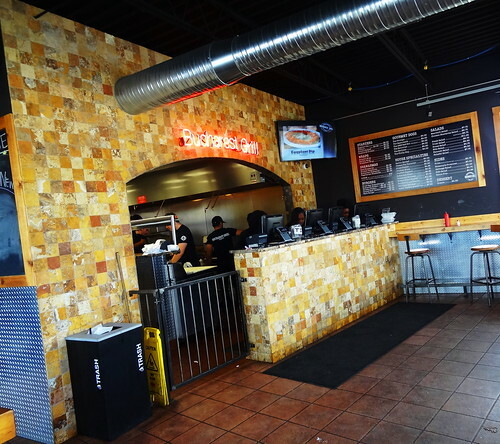 We’re grabbing a bite to eat at Bucharest Grill on Piquette Ave. This wildly popular restaurant began as a take-out counter inside The Park Bar. 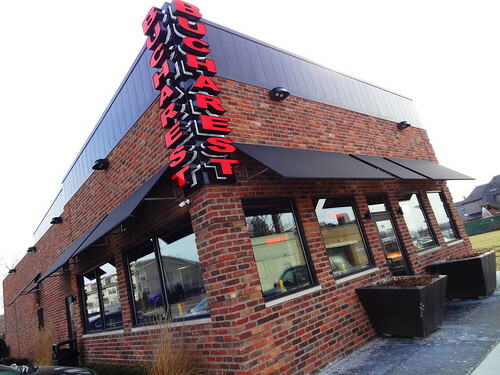 After a parting of ways Bucharest has branched out with 3 Detroit locations. 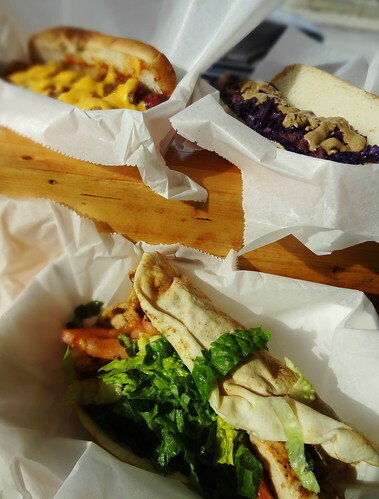 The food is all handmade from original recipes, they serve Romanian dishes, Middle Eastern cuisine and hot dogs. Everything is fresh, fair-priced and delicious! Shawarma is a must, throw in a couple of hot dogs and we’re set. We take a seat at the window overlooking Piquette while we wait for our food to be prepared, it doesn’t take long. The chicken shawarma is the best I’ve ever eaten; grilled marinated chicken breast, tomato, lettuce, pickles and to-die-for garlic sauce all wrapped in a pita. The Hamtramck is a kielbasa dog topped with braised red cabbage, bacon and spicy mustard tucked into a sesame seed bun, so good. The Detroiter is knockwurst drenched in coney sauce, grilled onions and cheddar cheese on a sesame seed bun, yum! This place is always packed but they get you in and out quickly. Amazing art and tasty food; not a bad way to spend the day.